Der Sharing Bildschirm bereitet Bildmaterial f�r die Bildschirmfreigabe auf Miiverse vor. (Der Zugriff erfolgt �ber das HOME-Men�.) Mit SDK Paint ist es m�glich die Schichten des Kunstwerkes in ein 2D Bild oder ein Anaglyphen 3D Bild zusammen zu setzen. F�r Anaglyphen Bilder wird jede Schicht des Kunstwerks als eine unterschiedliche Tiefe im 3D Raum behandelt. Um das Bildmaterial f�r den Austausch vorzubereiten w�hlen Sie die entsprechende Einstellung unter 3D Effect (3D-Effekt), Depth of Field (Sch�rfentiefe), und Converge Layer (Konvergenz-Schicht), dann klicken Sie auf die Miniaturansicht f�r das Kunstwerk. Das exportierte Bild wird auf dem Bildschirm erscheinen. Der 3D Effect bestimmt wie verlagert jede Schicht ist, f�r die Anaglyphen 3D. Einstellung auf Off generiert ein 2D Bild. Depth of Field geben den Anschein einer SLR-Kamera-Fotografie. Die Converge Layer gilt als Bildschirmtiefe. Schichten unterhalb des Converge Layer erscheinen tiefer als der Bildschirm zu liegen, und Schichten oberhalb des Converge Layer scheinen aus dem Bildschirm zu springen. The Sharing screen prepares artwork for posting to Miiverse (accessible via the HOME Menu) or for exporting to the online gallery. With SDK Paint, it is possible to composite the layers of the artwork into a 2D image or an anaglyph 3D image. 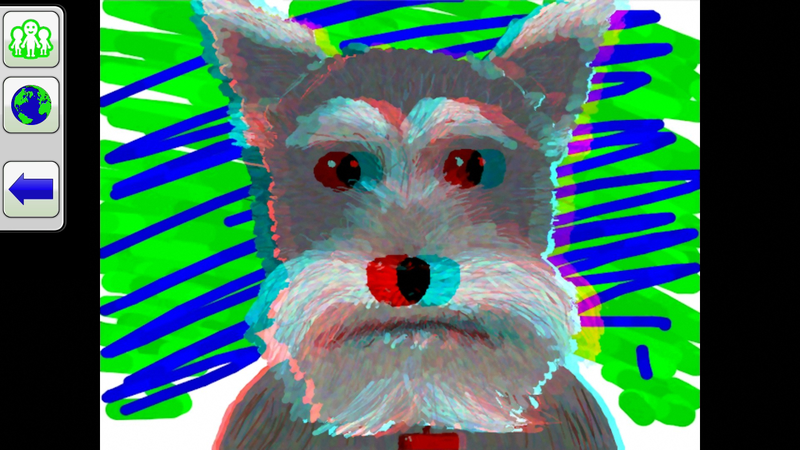 For anaglyph images, each layer of the artwork is treated as a different depth in 3D space. To prepare artwork for sharing, chose the appropriate setting under 3D Effect, Depth of Field, and Converge Layer, then tap on the thumbnail icon for the artwork. The exported image will appear on the TV screen. The 3D Effect determines how displaced each layer is, for the anaglyph 3D. Setting this to Off generates a 2D image. The Depth of Field blurs layers outside the Converge Layer to give the appearance of SLR camera photography. The Converge Layer is considered screen depth. Layers below the Converge Layer appear deeper than the screen, and layers above the Converge Layer appear to jump from the screen. La pantalla Sharing prepara arte para compartir a Miiverse (acceso a trav�s del men� HOME). Con SDK Paint, es posible compuesto de las capas del arte en una imagen 2D o una imagen 3D anaglifo. Para im�genes de anaglifo, cada capa del arte es tratada como una profundidad diferente en el espacio 3D. Para preparar el arte para compartir, eliga el ajuste apropiado para el 3D Effect (Efecto 3D), Depth of Field (Profundidad de Campo), y Converge Layer (Capa de Convergencia), luego presione el icono de miniatura. La imagen exportada aparecer� en la TV. El 3D Effect determina c�mo desplazadas est� cada capa, que aumenta la percepci�n de profundidad. Si se establece en Off genera una imagen 2D. El Depth of Field desenfoca capas fuera del Converge Layer para dar la apariencia de la fotograf�a SLR c�mara. El Converge Layer se considera la profundidad de la pantalla. Capas debajo de la Converge Layer aparecen m�s all� de la pantalla, y capas sobre la Converge Layer aparecen saltar de la pantalla. L'�cran Sharing pr�pare l'oeuvre pour le partage de Miiverse (accessible via le menu HOME). Avec de la peinture de SDK, il est possible de composite les couches de l'oeuvre en une image 2D ou une image 3D anaglyphe. Pour les images anaglyphe, chaque couche de l'oeuvre est assimil� � une profondeur diff�rente dans l'espace 3D. Pour pr�parer l'oeuvre pour le partage, a choisi les param�tres appropri�s de 3D Effect (Effet 3D), Depth of Field (Profondeur de Champ), et Converge Layer (Couche de Convergence), puis appuyez sur l'ic�ne miniature pour l'oeuvre. L'image export�e s'affiche sur le t�l�viseur. Le 3D Effect d�termine comment d�plac�s chaque couche est, pour l'anaglyphe 3D. D�finir � Off g�n�re une image 2D. Depth of Field brouille les couches � l'ext�rieur de la Converge Layer pour donner l'apparence de la photographie appareil photo SLR. Converge Layer est consid�r� comme profondeur d'�cran. Couches sous la Converge Layer apparaissent plus profonds que l'�cran, et couches au-dessus de la Converge Layer semblent passer de l'�cran. Sharing schermo prepara l'opera d'arte per la condivisione di Miiverse (accessibile attraverso il menu HOME). 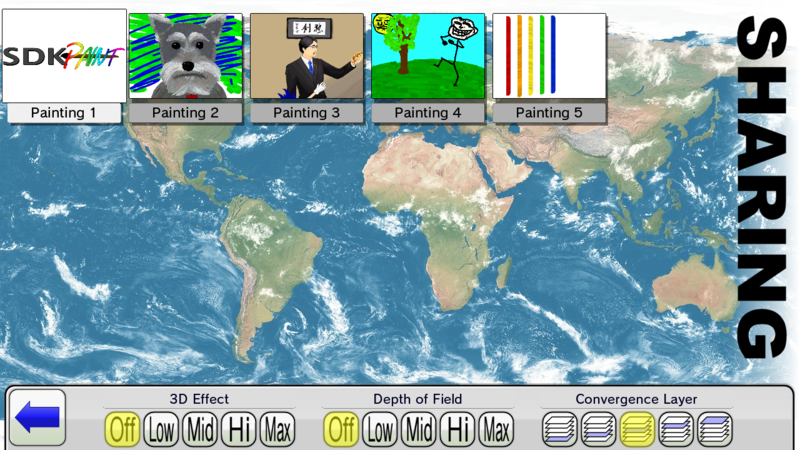 Con SDK Paint, � possibile composito gli strati dell'opera d'arte in un'immagine 2D o un'immagine 3D anaglifi. Per immagini anaglifi, ogni strato di opera d'arte � trattata come una diversa profondit� nello spazio 3D. Per preparare l'opera per la condivisione, ha scelto l'impostazione appropriata sotto 3D Effect (Effetto 3D), Depth of Field (Profondit� di Campo), e Converge Layer (Strato di Convergenza), quindi toccare l'icona Anteprima per opera d'arte. L'immagine esportata apparir� sullo TV. Lo 3D Effect determina come sfollati ogni strato �, per l'Anaglifo 3D. Impostando questa opzione su Off genera un'immagine 2D. La Depth of Field sfuma strati all'esterno dello Converge Layer per dare l'apparenza della fotografia fotocamera SLR. Lo Converge Layer � considerato la profondit� dello schermo. Strati sotto lo Converge Layer visualizzato pi� profondi che lo schermo e strati sopra lo Converge Layer per passare dallo schermo. This screen serves as the hub for sharing content with the online gallery from either the Wii U or the iPad version. For the Wii U, art can be imported by the same Nintendo Network ID to other supported Wii U titles. Additionally, anyone using the Internet browser on the Nintendo 3DS will be able to view artwork as stereoscopic 3D MPO images.